I became fascinated with Education when I took Education 20 with Professor Andrew Garrod at Dartmouth College. Up to that point, I had been a Computer Science Major modified with Music (“modified” was Dartmouth’s version of a minor). After ED20, I switched to CS modified with Education. My focus in those days was on moral psychology and constructivist and constructionist practices (especially the work of Seymour Papert at MIT). After graduation, I worked for Dartmouth College’s Computing Services and began teaching “Minicourses” — classes for faculty, staff, and students in using computing resources — and soon began creating my own classes. My most popular class was a sweeping overview of the Internet. The class started in 1992 when the best tools for finding information online were Gopher and WAIS. Once the Web came on the scene, participation in my class quadrupled and I began hosting it in an auditorium for classes of 100+ people. The Internet was exploding onto the scene all over the country and my class helped faculty and staff understand what it was and what impact it would have on their teaching, administrating, and communicating. The teaching bug had bitten me. During this time, I also began guest lecturing in Education classes at Dartmouth and help create and acted as a teaching assistant for Engineering Sciences 4: The Technology of Cyberspace at the Thayer School of Engineering with professors George Cybenko and Doctor Joseph Henderson. 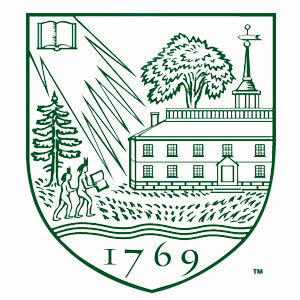 I also was invited to give talks on the Internet at a number of Dartmouth Alumni Clubs in New England. It was also around this time that I founded a virtual community, The Friends Zone. This close-knit group of friends who met via this community and are from all over the world, is responsible for quite a few weddings and subsequent children. The Zoners (as we call ourselves) are now planning the Zone’s 20th birthday with a get together in 2015. Soon after, I was accepted into Harvard Graduate School of Education’s Technology in Education Masters program (now called Technology, Innovation, Education) and spent the next two years researching many aspects of teaching and learning using technology including a fascinating course, Neuropsychology, in using technology to assist learners with various disabilities (a class in which we spent the entire first half researching a specific morphology and the second half designing an intervention specific to that issue). Another major focus for me was in the use of online communities for teaching and learning, which lead me to the work of Amy Bruckman, then at the MIT Media Lab. During my two years at Harvard, I was a teaching fellow for a number of courses taught by Professor George Brackett. This is notable in that teaching fellowships are normally reserved for doctoral students. 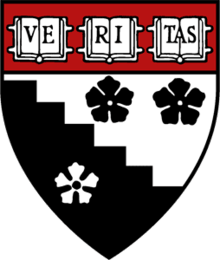 After Harvard, I joined Universal Learning Technology providing technical support for faculty using Bravo!, a Learning Management System (LMS) developed by ULT. Rather than reinventing the wheel, ULT soon turned around and bought Vancouver-based WebCT and kept its name and I took over managing the Vancouver technical support team (growing it from 10 to 65 in a year and a half) as well as the Boston-based Technical Operations team. I managed a multi-million dollar budget and four directors managing a department of over 75 people all the while improving our service to WebCT’s customers and staying on budget consistently. 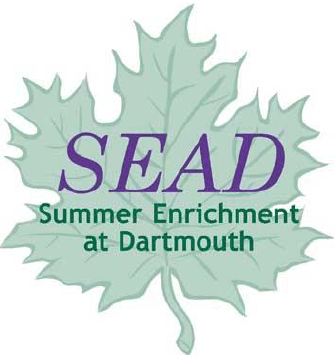 In the summer of 2001, I was invited back to Dartmouth to the inaugural year of the Summer Enrichment at Dartmouth (SEAD) program as a Master Teacher. I adapted my internet class I used to teach years before for a younger audience and updated for the changes in the half decade since I last taught the class. For two weeks, I worked with inner-city and rural kids who spent their mornings in class and their afternoons hiking, swimming, canoeing, and more. It was an amazing experience! One page flier explaining our approach to DAISY over the telephone. My career shifted into project management and I brought my experience with accessibility to Devis working on Disability.gov (then DisabilityDirect.gov) to make a graphcially rich website that was also an exemplar of accessibility. I wrote a white paper on the subject and presented at a number of events in the DC area. 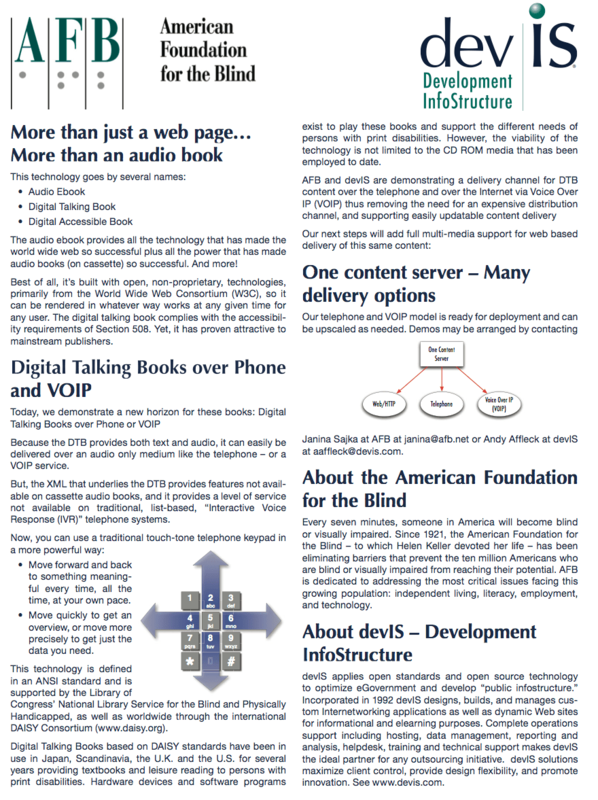 In 2003, I was contacted by Janina Sajka, then at the American Foundation for the Blind, to collaborate on a tool that would allow blind people to navigate content over a telephone using the DAISY standard for navigating hierarchical content. This lead to a speaking engagement at the DAISY Conference in Amsterdam, NL in May 2003. I also began researching the use of Podcasting as a tool in Education returning to Harvard to discuss this at an alumni-student get together. I wrote a book on podcasting and an article for MacWorld during this time. I was also invited to present at the 2008 New Media Expo in Las Vegas on basic podcasting with Garageband on the Mac. Article on NPR.org, July 11, 2011. Since 2005, I have worked for various companies as a Project Manager, moving from contract to contract as work began and ended but always kept up my involvement with technology in education. Most recently, I have researched, written, and spoken about teens and social media and started a blog to explore that subject in depth, NavigatingTheWaters.com. My writings on this subject have been published on TidBITS.com and resulted in my inclusion in an article on NPR.org by Linton Weeks and a speaking invitation to the #140 Conference in Kingston, NY in 2012. I have been an adult leader in both the Cub Scouts (Den Leader for every year as well as Assistant Cubmaster) and Boy Scouts (Assistant Scoutmaster and Merit Badge Counselor) and am currently an adult leader with a Venture Crew. I am the Assistant Creative Director in charge of the Education program at Swamp Meadow Community Theatre. In this role, I coordinate education programs for the members of the theater as well as for the general public. I also teach the 7th grade class at First Unitarian Universalist of Providence, RI on Sundays. Finally, I am a volunteer admissions interviewer for Dartmouth College, interviewing prospective high school seniors in Rhode Island.